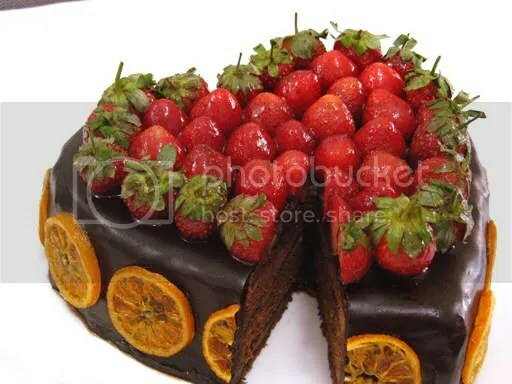 This is simply flourless chocolate sponge cake with milk chocolate ganache and kiwi slices filling, covered with whipped ganache and dark chocolate ganache, decorated with strawberries and candied mandarin oranges (kino oranges). All the freshness and the taste of chocolate I love. This is for participating in A Heart For Your Valentine, and the round up is here. Mostly, like any other Asian desserts, are made of glutenous rice flour, palm sugar, and coconut milk to taste. No butter, no milk. Those ingredients are mostly boiled until thickened. Thicker than custard, more like a pliable jelly. Then we’ll add the sauce. Or simply put the dough, which are already shaped into marble sized balls, into the palm sugar sauce and boiled again for a couple minutes. To serve, put the balls and the sauce in glasses topped with about a tablespoon of thickened coconut milk. Since my old wordpress account is not no longer available (I forgot the password, duh!) from now on, this is going to be my kitchen journal :D.